A unique 19th-c. ornamental garden with winding pathways that leading to tiny follies and ornately bridged streams and ponds. In the centre a Swiss style chalet rises above sweeping lawns, sheltered by tall trees, under planted with mature shrubs. During the spring the garden is ablaze with bulbs, primroses and rhododendrons. A good selection of old-fashioned roses bloom in summer. The Abbey's lovely 42 acre Victorian gardens have recently undergone extensive restoration work. 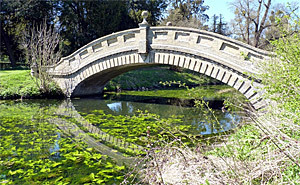 Features include richly planted herbaceous borders, a horn beam maze, a woodland garden, follies and a camellia house. There is also a kitchen garden, a fine rockery, grotto and a bog garden planted with carnivorous plants. One of the most spectacular gardens in England. These formal gardens were created over a span of 150 years, inspired by the gardens of Versailles. 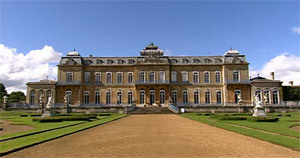 Highlights include a magnificent Orangery, Italian garden and parterre filled with impressive 19th-c. statues. 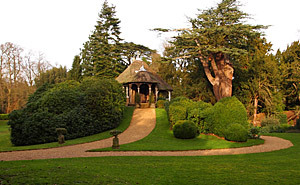 Amongst the many follies and garden buildings is an 18th-c. pavilion designed by Thomas Archer, a bath house and a Chinese Pavilion.